Nestled into a hilly mountain scape flooded with red terrain the Spanish Villa provides a worldly escape for two. The Villa is completely exposed to the European sun therefore careful consideration to materiality was important. Respecting and harmonizing with its context also played a vital part in the design of the holiday home. The Spanish Villa is a European holiday home for a retired Australian couple. The clients fell in love with the site for its mountainous terrain and red colored earth which reminded them of the Australian outback. Thus while on holiday this villa home still maintained a strong connection to home. While at first it was tempting to create a cutting edge futuristic sculpture, the beauty of the site and its surroundings seemed to demand a more subtle take on modernism that incorporated elements of classical styling combined with local history. Overall the structure is pure and simple, essentially just one rectangular block however it does feature cues to classical architecture with rustic fixtures. The front of the building reads as if the building had been there for centuries; perfect symmetry and proportion with a perfectly colonnaded terrace on the first floor. This generous open space was conceived as place for entertaining and celebrating the home grown wine whilst viewing the spectacular sunset light-show in the mountain backdrop. Designed to withstand the harsh sun and remain as maintenance free as possible, careful consideration was given to the finishes and fixtures. Many elements were chosen for their ability to age well. Thus many of the doors, handles, basins and other various fittings and fixtures were salvaged from local junk yards and antique stores. The idea was that if it had survived for a hundred years and still worked it was likely to survive and work for another hundred years. The house itself is relatively modest with just two bedrooms and a generous shared bathroom. Excluding the terrace there is only one living space of which extends out to a large covered outdoor area. 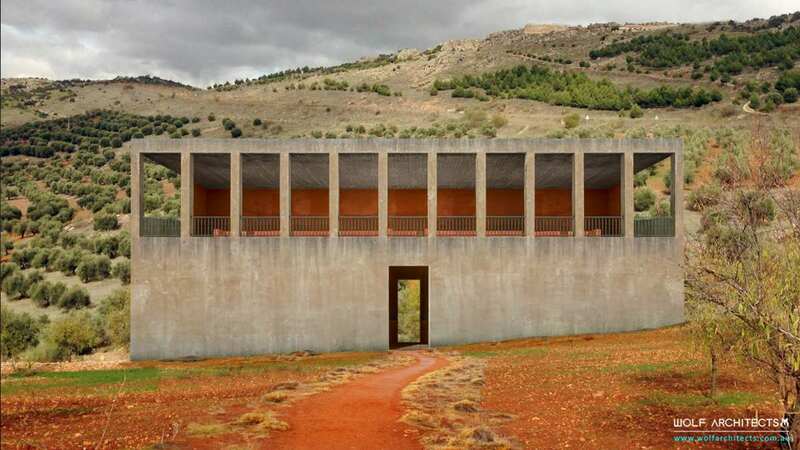 The outdoor living area connects to an in ground salt water swimming pool that is almost completely surrounded and flush with the red earth of the site. Externally the building is finished with a Toscano render and the color blends naturally with the soil harmonizing with the context of the surroundings. The finished surface will over time develop fine cracks and mould which intentionally will add character and add to the charm of the home.